Play 1 of the Ayckbourn trilogy begins at 1 o’clock on a sunny Saturday afternoon and Play 3 finishes at nearly 10.30 on a cool evening. I am quite ready for Play 4. 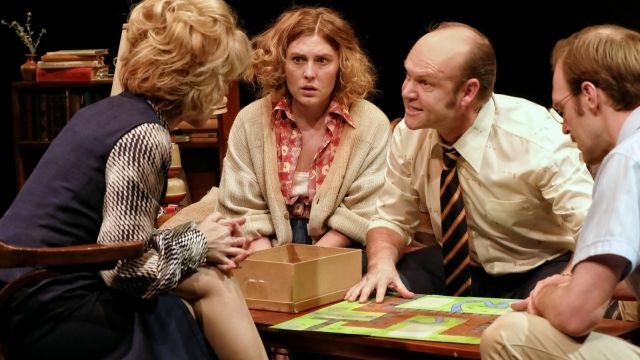 Written in the early 1970’s in a rush of creativity, these three plays — designed to be seen in any order — stand as the peak of the author’s achievements (and he’s written over 80 plays), a brilliant, Chekhovian comedy of family manners. See them and be amazed. Director Mark Kilmurry has assembled an ace cast, led by Yalin Ozucelik as the conquering Norman, an Assistant Librarian on the hunt for women — any woman will do — to come under his special spell. This includes his two stay-at-home sisters-in-law, Annie and Sarah (Matilda Ridgeway and Danielle Carter), and his cool Financial Adviser wife, Ruth (Rachel Gordon). The cast is completed by Brian Meegan as Reg, Estate Agent and inventor of extravagant board games, and Tom, a slow-moving, ‘dim’ local vet with an eye for Annie and Annie’s cat. A hesitant ‘Um’ is Tom’s most persistent quotation. Unseen but ever-present is the owner of this grand, crumbling house in the English countryside. Mother is fading away on an upper floor, looked after by a resentful Annie, who has called the family here so she can get away for a weekend with Norman, a self-confessed 3-women-a-day man, ‘a gigolo trapped in a haystack’. 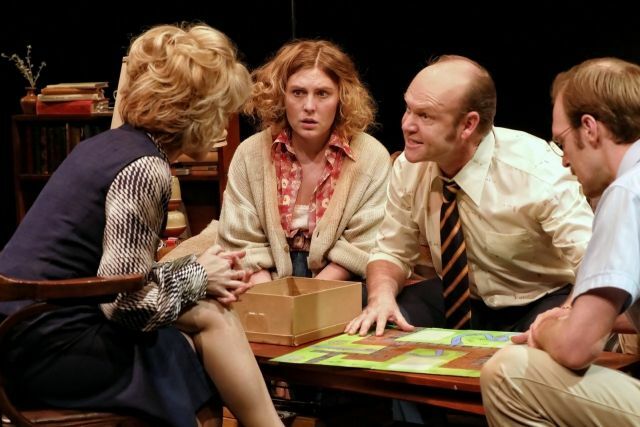 It’s part of the pleasure of watching these three very English plays to see Norman, like an ‘oversized dog’, weighing his chances with the ladies at any moment. Although the house is renowned for its brown colour, Set Designer Hugh O’Connor has put each of the three sets in front of black backgrounds, forcing us to watch the characters. The setting for Play 3 – an overgrown spring garden – is particularly fine. A choice selection of late-60s/early-70s music tracks accompanies the action.